These were the perfect consistency and tasted great with a teeny bit of honey. Here's the recipe from Rather Be Baking. Enjoy! *Frozen berries are perfectly fine! Add butter and pulse until dough is the consistency of small peas. Pour mixture into a large bowl. In a small bowl, combine yogurt and egg and whisk until thoroughly mixed. Make a well in the center of the dry mixture and pour in yogurt/egg mixture. Add berries and stir gently until just combined. With a large spoon, scoop out 12 lumps of dough onto the cookie sheets, spread 2 inches apart. With floured fingers, gently shape dough into wedges. Brush with milk and sprinkle with 2 tablespoons sugar. Bake for 13 to 15 minutes or until golden brown and a cake tester is inserted in the middle and comes out clean. Let cool on the baking sheets for a few minutes and then transfer to a wire rack to cool completely. I adore mixed berries. I have some in my freezer - perfect boiled down a little and served with some greek yoghurt. Yummy recipe! Hi! I found your blog rather randomly and I enjoy your posts. 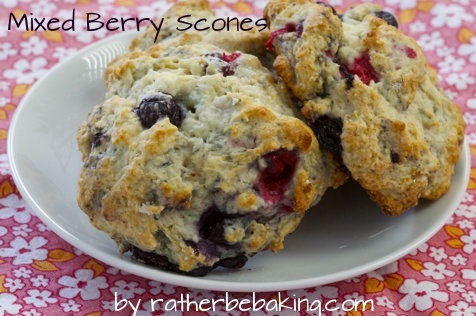 I have a weakness for all things "scone." I can't wait to try these! Thank you Brooke! I hope the scones turn it great for you!